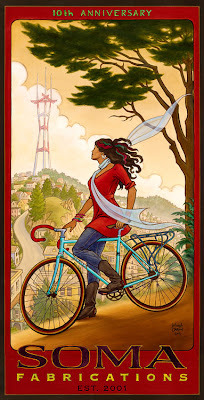 Mona Caron is a renowned artist, muralist and cycling advocate from San Francisco. When I look at this image, I see myself, a native San Franciscan, a cyclist, an advocate, an activist, a dreamer. Liberated. Connected. Creative. In touch with life and her surroundings. I believe this image will carry similar meaning to many women (and men) just like me. Which is why I'm sharing it with you. Dream on and ride on, friends! If we can imagine a better biking future, then together we can make that dream a reality. Starting today. Don’t discuss bloomers with every man you know. This is how SF does it. I resolve to ride on!